This section provides an example of how you can create a filter with integer coefficients. 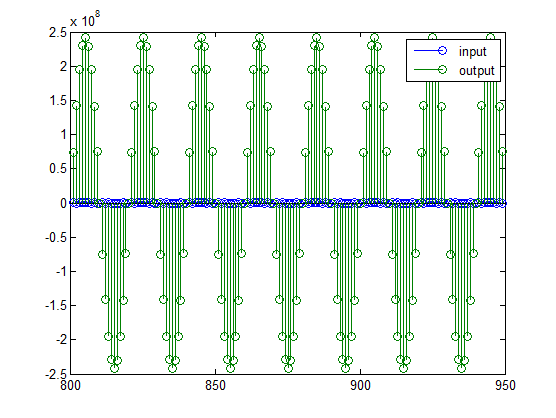 In this example, a raised-cosine filter with floating-point coefficients is created, and the filter coefficients are then converted to integers. It is a coincidence that B and L are both 18 in this case, because of the value of the largest coefficient of b. If, for example, the maximum value of b were 0.124, L would be 20 while B (the number of bits) would remain 18. 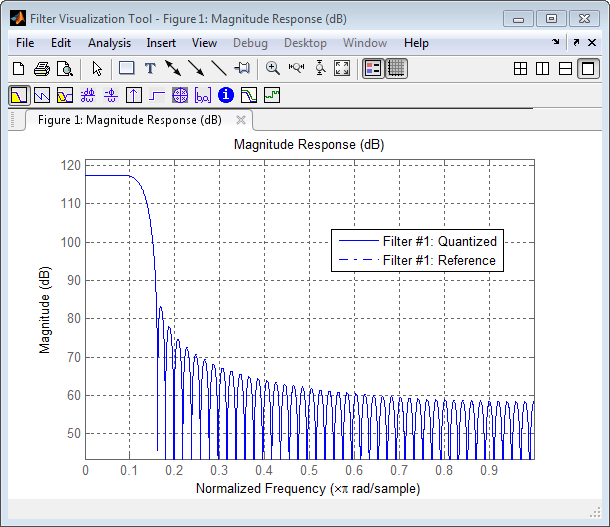 This shows a large gain of 117 dB in the passband, which is due to the large values of the coefficients— this will cause the output of the filter to be much larger than the input. A method of addressing this will be discussed in the following sections. The info method returns a summary of the filter settings. In this case, all the fractional lengths are now set to zero, meaning that the filter h is set up to handle integers. 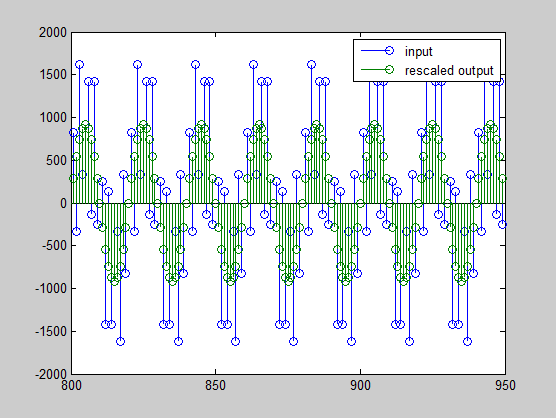 You can see how the signals compare much more easily once the scaling has been done, as seen in the above figure. you will notice that the number of bits in the output is considerably greater than in the input. Because such growth in the number of bits representing the data may not be desirable, you may need to truncate the wordlength of the output. The best way to do this is to discard the least significant bits, in order to minimize error. However, if you know there are unused high order bits, you should discard those bits as well. To determine if there are unused most significant bits (MSBs), you can look at where the growth in WordLength arises in the computation. In this case, the bit growth occurs to accommodate the results of adding products of the input (12 bits) and the coefficients (18 bits). Each of these products is 29 bits long (you can verify this using info(h)). 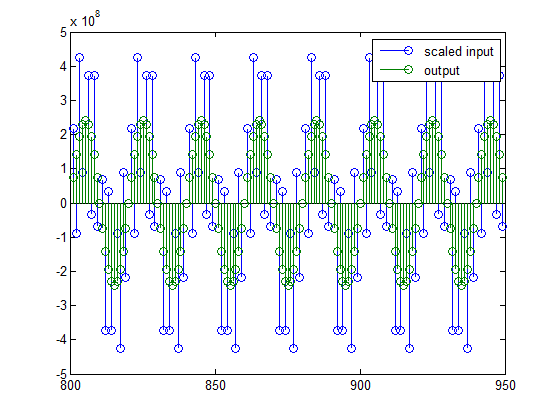 The bit growth due to the accumulation of the product depends on the filter length and the coefficient values- however, this is a worst-case determination in the sense that no assumption on the input signal is made besides, and as a result there may be unused MSBs. You will have to be careful though, as MSBs that are deemed unused incorrectly will cause overflows. Suppose you want to keep 16 bits for the output. 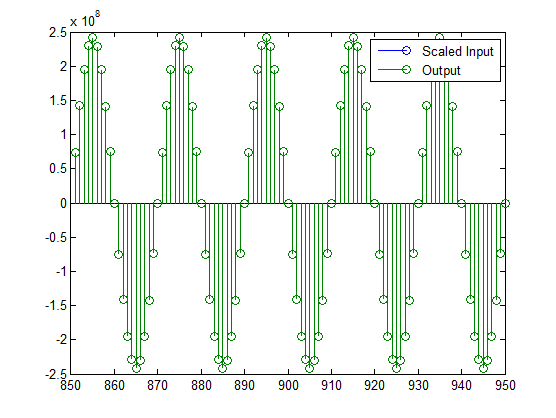 In this case, there is no bit-growth due to the additions, so the output bit setting will be 16 for the wordlength and –14 for the fraction length. 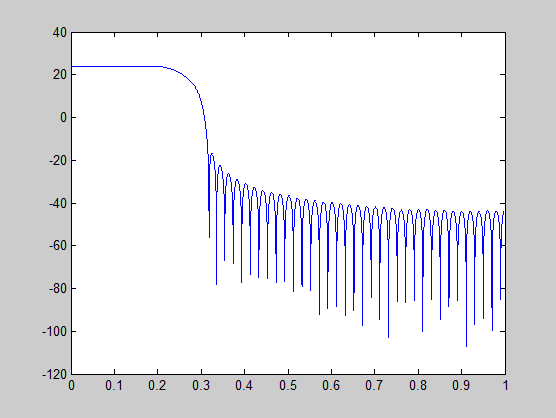 This plot shows that the passband gain is still above 0 dB. 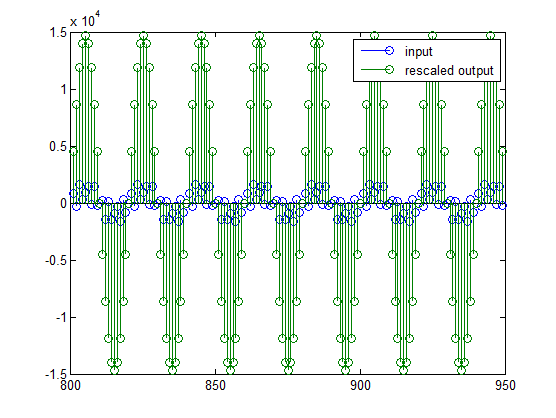 This operation is equivalent to scaling the filter gain down by 2^(-18). 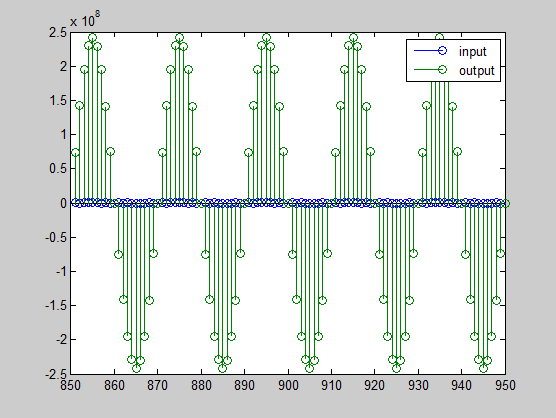 The above plot shows a 0 dB gain in the passband, as desired. The set2int method provides a convenient way of setting filter parameters to work with integers. The method works by scaling the coefficients to integer numbers, and setting the coefficients and input fraction length to zero. This makes it possible for you to use floating-point coefficients directly. Here you can see that all fractional lengths are now set to zero, so this filter is set up properly for working with integers. 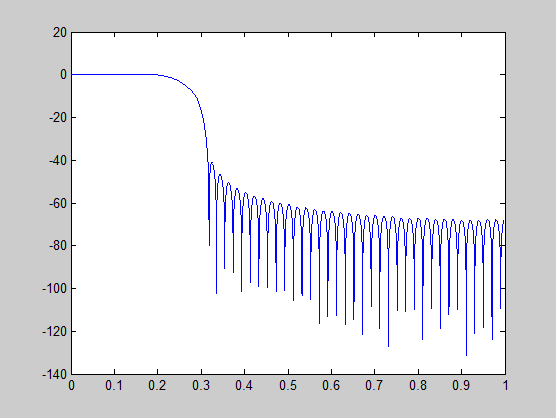 You can compare the output to the double-precision floating-point reference output, and verify that the computation done by the filter h is done in full precision. 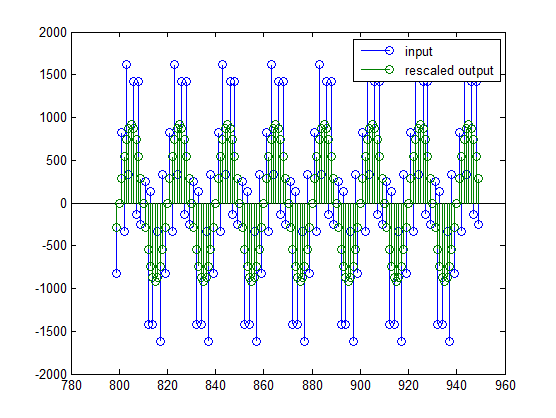 This final plot shows the filtered data re-scaled to match the input scale.